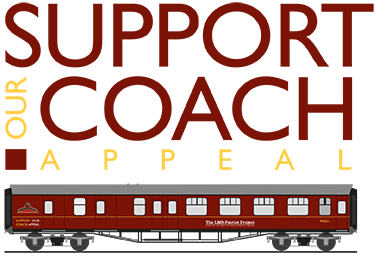 The LMS-Patriot Project originally acquired two genuine Fowler tenders, as a start point for the construction of the new tender. The first tender was formally handed over to Cambrian Transport on 4th May 2010 in a ceremony involving the Vale of Glamorgan Council, Cambrian Transport and Directors of the LMS-Patriot Project. 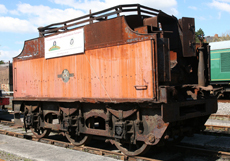 This tender was completely dismantled in December 2010 and the driving wheels were turned and the journals polished at Tyseley Locomotive Works. The springs were refurbished by Owen Springs in Rotherham. Two of the axle boxes were removed for refurbishment. The other four were damaged and not useable. Unfortunately the the frames were found to be badly corroded and beyond economic repair. 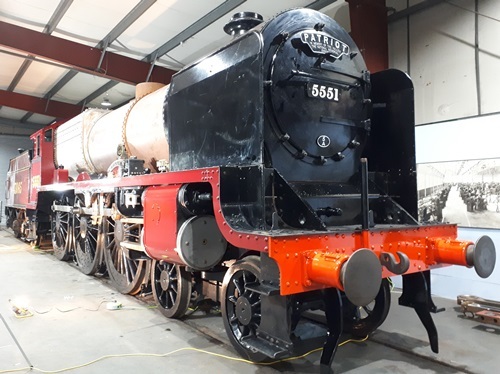 The opportunity to acquire a second Fowler tender arose in July 2012 when the East Lancs Railway agreed to sell a spare Fowler tender to the LMS-Patriot Project. 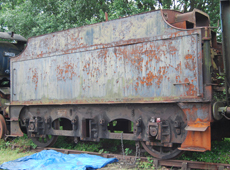 This Bury tender, also in ex-Barry scrapyard condition, seemed to be in better condition, with less corroded frame plates. Work on the tender - fitting new frames and dragboxes and refurbishing the outer frames of the Bury tender - was started in September 2014 by the East Midlands company Rowlescourt Engineering. In the event, it was found necessary to replace the outer frames as well, as further corrosion was discovered during the refurbishment work. 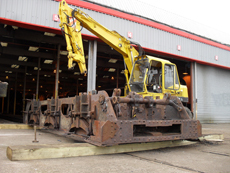 However the two original tenders have provided all six axleboxes for the project - two having been repaired and the other four to be refurbished. 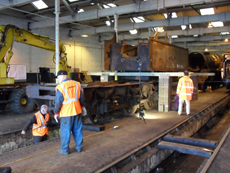 The tender frame was returned in 2016 to Llangollen, where some limited work continued alongside the chassis assembly, as resources allowed. Engineering drawings are being produced to enable a new tender tank to be manufactured. The new tank will be made slightly wider with a slightly reduced coal space to enable an increase in water capacity to around 3900 gallons.